Gantt chart is used basically in project management. In the worksheet, you see a simple Gantt Chart, created using the piece of data on the left of the chart. The Horizontal Axis (it is also called Value Axis) represents the total time span of the project. Each Bar in the Gantt Chart represents the duration of a task. The project manager can easily identify the overlapping tasks of the Project. So Gantt chart is very important in project management. In the data table, column A contains the task name, column B contains the start date of the task and column C contains the duration to finish the task. Note: One important thing is: column A must not have any heading, otherwise column A and column B both will be used as the category axes. OK, let’s start creating this Gantt Chart from scratch. We shall use the following data to create the Gantt chart. You can download the exercise file from the download section too. Click here to read the transcript of the above video. A Gantt chart is a horizontal type bar chart. Gantt chart is used basically in project management. By default Excel does not support any Gantt type chart. But you can create advanced level Gantt chart in Excel. In the worksheet, you see a simple Gantt Chart, created using this piece of data. The horizontal axis represents the total time span of the project, each bar represents the duration of a task. The project manager can easily identify the overlapping tasks of the Project. So Gantt chart is very important in project management. Column A contains the task name, column B contains the start date of the task and column C contains the duration to finish the task. One important thing is: column A must not have any heading, otherwise column A and column B both will be used as the category axes. OK, let’s start creating this Gantt Chart. Same values are in the second worksheet. I open it. I select a cell within the data, Insert tab, in Bar chart drop down, I select Stacked Bar chart. I delete the legend and make the chart a little bit wider. On the category axis, the “Board Meeting” takes position at the top, but in project management data, Planning Meeting is topping, I double click on the category axis and in the Axis options, I reverse the category order. 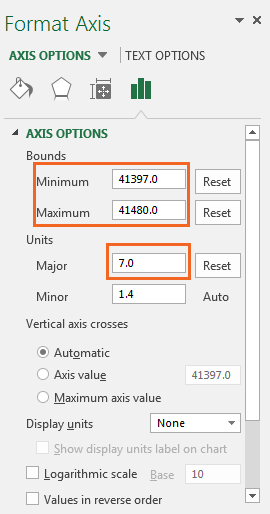 When I reverse the category order, the horizontal axis also changes its location, I click on this axis, in the axis options, and then in Labels, I select Label Position at high. You see, Board Meeting is at the high position, so the axis labels take position here. You see the horizontal axis starts from 07/03/2013, so, this blue zone actually shows the days between 07/03/2013 and 03/05/2013. Let’s find out how many days are between these two dates. You know Excel treats dates as numbers. The serial number of date 7/3/2013 is 41340, and the serial number of date 3/5/2013 is 41397. So there are total 57 days between these two dates. So this blue range is actually representing number 57 and this red zone is representing number 3. So this is how this chart is working. Now our first task of the Project: “Planning Meeting” task starts from the date 03/05/2013, so our horizontal axis will start from this date. I double click on the horizontal axis, Format axis task pane appears. In the Axis options, the minimum value is set as 41340; we know that “41340” is actually representing this date. Equivalent number for date 03/05/2013 is 41397; I put number 41397 as the minimum value. Maximum value is automatically set, but I change it to 41480. And I change major units to 7. I want to change the number format, in the format code I type: dd/mmm. The dates are now looking more meaningful. Now I select the blue colored data series, in the Fill and Line tab, I use No Fill for this data series. You see, we have already got a Gantt Chart. Now this chart needs some formatting. I click on this data series, as Gap width value I put 30% to decrease the Gap Width between Axis values. In the Fill I use Solid Fill and in the 3-D format, I use some 3-D action. You see our chart is almost ready. I show the Data Labels for this axis. I change the Chart Title content to Project Schedule; make it bigger in size. I place the Chart title here; I want to show horizontal grid-lines, in the Grid Lines, I select Primary Major Horizontal. You can do easily the rest of the formatting. Just use some background color for the Chart Area, and make the grid lines dashed. So this is how you can create a Gantt Chart. Open a blank worksheet and copy paste the above data. Now select a cell within the data. 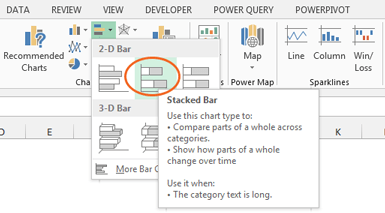 Then click on the Insert tab, in the Charts group of commands click on the Insert Bar Chart drop down, from 2-D Bar section, I select Stacked Bar chart. By default the following chart is created. I have selected the Legend in the chart, you also select it and delete it. Make the chart a little bit wider to get more space to work. By default, this Stacked Bar Chart is created. Delete the Legend from the chart. On the Category Axis(in the chart the Vertical Axis), the “Board Meeting” takes a position at the top, but in project management data, Planning Meeting is topping, I double click on the Category Axis, Format Axis task pane appears. 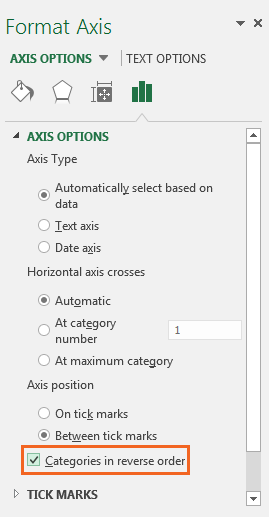 In the Axis Options tab, select the Categories in reverse order option. Select the Categories in reverse order option. When you reverse the Category order, the Horizontal Axis(value axis) also changes its location. 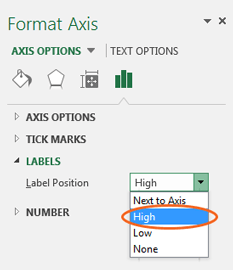 Click on the Category Axis, again in the Format Axis task pane, and under Axis Options tab, contract the Axis Options, and extend the Labels, select Label Position at High. Change the Labels position at High for the Horizontal Axis. Observe the data of the chart: “Board Meeting” is the last data. So, “Board Meeting” is regarded as the high position. When I have selected Label Position High for Horizontal Axis(value Axis), in the following chart you see: Horizontal Axis is taking position on Board Meeting side, I mean the High side. Observe the following chart closely to understand what I am saying. This is an important concept you have to understand. Board Meeting data is at high. Horizontal Axis is also at High position. You see the Horizontal axis starts at date 07/03/2013. 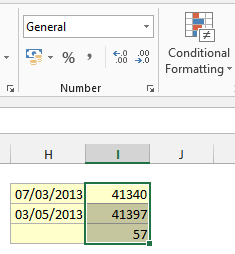 The date 07/03/2013 is selected by Excel. You did not input it. Every chart starts from a value. Excel by default set that value, but you can set from which value a chart will start. Look at the above chart, from top, the first Blue Bar is representing value 03/05/2013 of Start Date data series of point “Planning Meeting” and the Red Bar is representing value 3 of Duration data series of same point “Planning Meeting”. Value of Start Date data series of Planning Meeting data point. At first the Data Series name. In the above chart data series is: Start Date. Then the Data Point name. In the above chart, you are seeing data point is Planning Meeting. And finally the Value of the Data Series. In above chart Value: 03/05/2013 is showing. So there are total 57 days are there between dates 7/3/2013 and 3/5/2013. Serial number of date 07/03/2013 is 41340 and serial number of date 03/05/2013 is 41397. There are total 57 days between these two dates. So in the chart, for Board Meeting data point, the blue bar is actually representing number 57 and the Red bar is representing number 3. So this is how this chart is working. Now our first task of the Project “Planning Meeting” starts from the date 03/05/2013, so our horizontal axis will start from this date. I double click on the horizontal axis, Format axis task pane appears. In the Axis options, the minimum value is set as 41340; we know that this “41340” is actually representing the date 07/03/2013. I set minimum value as 41397, the representing number of date 03/05/2013. The maximum value is automatically set, but I change it to 41480. And I change major units to 7. I want to change the number format, in the format code, I type: dd/mmm. The dates are more meaningful in this way. Now select the blue bars. In the chart below, you see all the Blue Bars are selected. 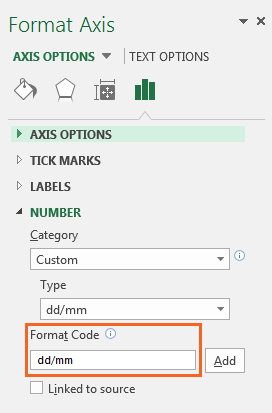 In the Format Data Series task pane and in the Fill and Line tab, select No Fill. You can also use the Fill Color drop-down of Home Ribbon. Now, look at the chart below. You see, we have already got a Gantt Chart. You are getting this Gantt Chart now. Now the above chart needs some formatting. 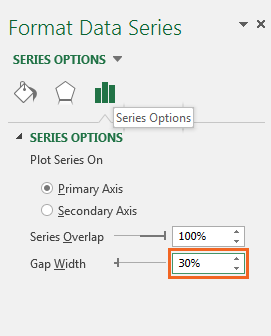 Click on the Duration data series(select any of the Red Bars), in the Format Data series task pane, and under Series Options, change the Gap Width value to 30%. It will decrease the Gap between the Category Axis position. 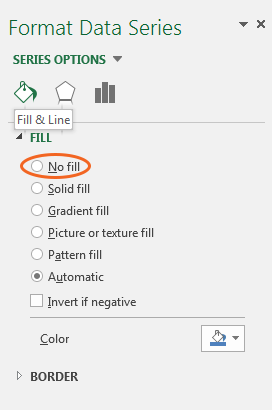 Format Data Series → Fill & Line → Fill → Solid Fill → Use a color for the Data Series. Format Data Series →Effects → Expand 3-D Format → Top Bevel drop down → Select Angle type Bevel. Show the Data Labels for this data series. To do that: click on the Chart Elements icon on the top-right corner of the chart. From the menu select the Data Labels option. 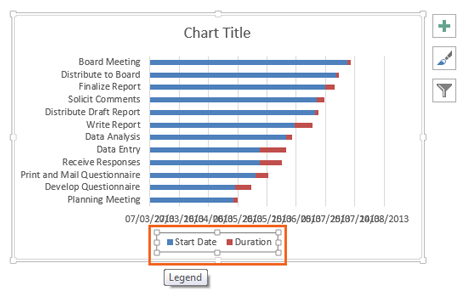 Change the Chart Title content to Project Schedule and make the Chart Title bigger in size. I want to show Horizontal grid-lines. Again Chart Element icon → Move your mouse over the Grid Lines option, → A little right arrow appears, click on it → From the drop-down: select Primary Major Horizontal option. You can use some different background color for your chart area and you can also make the grid lines dashed. It is up to you. This is the chart that I am getting finally. You will get a good number of Gantt Chart Templates in this link. So, you see making a Gantt Chart in Excel 2013 is an easy job. Just you have to practice and understand the concept of creating a chart. The rest is easy. Any Question on how to make a Gantt Chart in Excel 2013? Feel free to ask in the comment section. I will be very happy to hear from you and learn more in the way.